The Boxer Rebellion is now in PRINT. Due to popular demand we are proud to announce that The Boxer Rebellion is now available in a paperback version. It’s June – the gayest month of the year! Pride events are already springing up across our great nation with rainbows flying proudly. Families are bringing picnics, musicians are performing in the open air. Booths, displays and giveaways give free information and entertainment to the LGBT community. Children have their faces painted, pretty beads and balloons are everywhere. People stroll in public parks and down public streets holding hands or even kissing. And nobody has to hide. There is no shame allowed. That’s why it’s called PRIDE, by the way. I’m old enough to remember the first struggling Pride parades (if not old enough to have actually participated in any). And I grew up in an area of the country where conservative values have a choke hold on the community. So I’d never seen anything like the Twin Cities Pride, that is until 2002. The parade alone pulled a quarter of a million people, not all of them lesbians, or gays, or bisexuals, or transgendered folks. A whole lot of supportive straight friends and families contribute to the atmosphere of acceptance and collective strength. If you’re supportive of gay rights, find your local Pride event and go down and check it out. If you have friends that are supportive, bring them along. The more public support we have, the better. I never thought I’d live to see the day that I’d have a black president endorsing gay marriage and offering public support for our civil rights. Why, it’s enough to give one Pride, with a capital ‘P’. I have always loved books that stir stuff up, either socially or solely within me. So today I thought I’d pass along two of my favorite American political shock waving titles – AND I found them for free on Amazon.com! When I first read Upton Sinclair’s The Jungle I became increasingly supportive of federal regulations with regard to preparation and packaging of meats. Poor Sinclair said something like this once, “I aimed for their hearts but hit their stomachs.” Read this book before you eat your next can of spam. I love Uncle Tom’s Cabin, not because of the story or the style of prose, although it’s a fun read, but because it started a war. Harriet Beecher Stowe was a middle aged female author who was passionate about an issue, and through her dramatization captured the hearts and imaginations of not only her own country, but the world. President Lincoln said at the time that there would have been no Civil War without Uncle Tom’s Cabin, and he was right. I’ve linked here to a free Kindle version for those who haven’t had the pleasure of reading this yet. This morning I was scanning the news headlines and discovered an article by The New Civil Rights Movement website that reports Alan Scott, aka The Green Lantern (yes, the way cool super hero first introduced in DC comics 72 years ago in 1940), is not only gay – he’s now championing the fight against bullying! Perhaps not literally on the page, but by being an inspiring role model. [James] Robinson, a British writer who lives in San Francisco with his wife, is no stranger to gay characters – he wrote DC’s “Starman” comic in the 1990s, a groundbreaking title that starred a homosexual superhero. He said the only agenda he’s pushing is reality. It’s true Green Lantern isn’t the first comic book/superhero to come out gay – but he’s the most powerful, and longest respected comic book character to do so to date. He’s been a symbol of honorable integrity for over seventy years. Well done, D.C. Comics! Well done. Dharun Ravi gets 30 days – Is it enough? Dharun Ravi, as you may recall, bullied Tyler Clementi before he killed himself. After the talented Rutger’s freshman jumped to his death it was discovered that Ravi had set up a webcam to catch Clementi in a romantic encounter with the mysterious MB. When Ravi found out there was to be a second date, he Tweeted about it, urging others to watch with him. In his last hours, Tyler Clementi’s computer shows he visited Ravi’s Twitter page thirty-seven (37) times before leaving Rutger’s campus and driving to the George Washington Bridge. Dan Savage, a gay columnist whose video campaign, “It Gets Better,”began in response to other suicides of gay teenagers just before Mr. Clementi, 18, jumped to his death from the George Washington Bridge, argued that simply locking up Mr. Ravi was a lost opportunity to talk about the other institutions and people “complicit” in Mr. Clementi’s death. “What was he told about being gay growing up, by his faith leaders, by the media, by the culture?” Mr. Savage said. “Ravi may have been the last person who made him feel unsafe and abused and worthless, but he couldn’t have been the first. The outcry in the LGBT world was immediate: the system had failed Tyler Clementi and other bullied gay kids. A thirty day sentence wasn’t nearly long enough, given the severity of the crimes he was charged with, and ridiculous compared to standing convictions of similar charges. I’m an activist when it comes to LGBT bullying by kids and young adults, I’ve written three novels about it. And Dharun Ravi is guilty of invasion of privacy and bias intimidation – which means the jury was convinced that he bullied Tyler Clementi. A jury convicted him. He’s guilty – that’s now a fact no matter how often he says he’s not, unless another court overrules the finding of twelve honest Americans. How many times a day are the words, “But I didn’t do it on purpose,” heard in courthouses? Ignorance of the law is no excuse, and neither is disdain for human decency. 1. 30 days in jail may be nothing to a hardened, serial bully who searches for targets, but it’s a daunting sentence for a young man in a foreign country who acted arrogantly, rashly, and childishly. He was probably more bi-curious than anything else. In this instance, whether he realized it or not, he was being a bully. 30 days in jail, the conviction on his permanent record, and a scandal that will haunt him for the rest of his life is a harsh sentence for a kid’s act of stupidity, but quite appropriate for an act of bullying by a young adult that included not only private voyeurism but also the intent to cyber bully by sharing other episodes live on the internet. 2. $10,000 to support groups for victims of bias intimidation: That’s a lot of money. Period. I don’t care who you are, $10,000 is a lot of money. I hope his parents will make him pay them back every cent of it, but judging from the rather stereotypical Indian mother/son dynamic (Little Prince Syndrome) expressed in the courtroom, I doubt it very much. They will pay for everything and then spend more in trying to have his record expunged. 3. And the REALLY BIG part of Judge Berman’s sentence: 300 hours of community service, much of it to be served with LGBT groups. This is the real wisdom of the bench’s decision. Yes, Ravi is guilty of bias intimidation, but he doesn’t really realize it – even now. He understands the legal term, he understands the social ramifications, and he thinks he understands the intent – but he doesn’t. Not yet. 300 hours breaks down to 7.5 forty hour weeks. Whether he performs the better part of two months work all at once, or spreads it out over the course of time he’s been given, he will be deeply embedded in the culture fighting bigotry and arrogant disdain for human beings who are different. His arrogance will be shaken, if not outright destroyed, by what he learns. Dharun Ravi will come away a much better man for the experience. And isn’t that the point? Our courts are about Justice with a capital J, not vengeance dripping in blood and demanding it’s pound of flesh. Judge Berman has made a wise and fair decision that will force Dharun Ravi to come face to face with fear (jail time in a foreign country), make financial restitution to society ($10,000 worth), and finally be forced to learn about the very people he so casually disdained, face to face and upfront and personal. He will never look at or consider LGBT folks in the same way again. Until LGBT people are given equal rights and protections under the law, anti-LGBT bullying will happen. It’s human nature for some people to enjoy humiliating and degrading others. But cases such as this one are bricks that build a solid foundation of legal status. 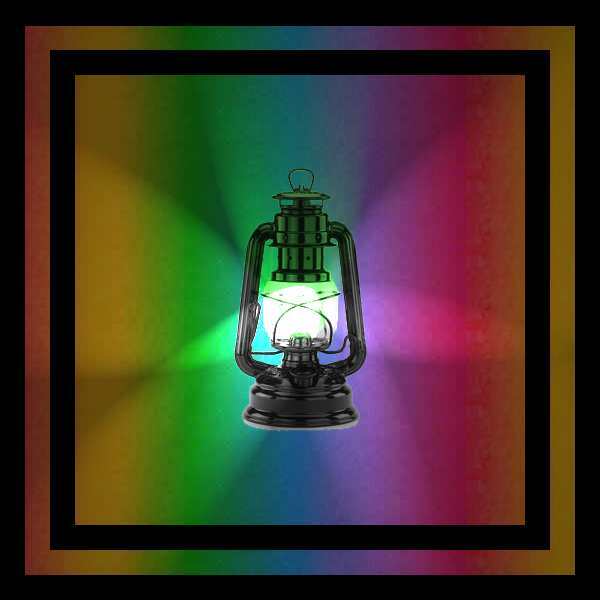 With each decision reaffirming LGBT rights as equal citizens, the day when true equality will be the law of the land. Tyler Clementi was bullied to death, but not ONLY at the hands of Dharun Ravi. He’d been bullied for years, and thought college would free him of it. When he found out the culture of bigotry was pervasive and systemic, he killed himself. Ravi was only the final straw. If Tyler had just held on a little longer, or taken a different approach to his arrogant, dismissive roommate, he would have found out that after you leave the ivy walls of education it really does get better for most LGBT people. Clementi’s artistry would have freed him, but he gave up and killed himself before learning that. He died at his own hand, of his own volition, and was not shoved off that bridge by anyone. He jumped. Ravi volunteered to start serving his 30 day jail term tomorrow, May 31, 2012, before the appeals made by both sides are heard. He has been lambasted on the world stage by news agencies hungry for blood, passionate activists, and furiously grieving family, and will be followed as a curiosity for some time to come. He’s been bullied by the press and others demanding he carry the total weight of human prejudice, and serve the time deserved by many. This privileged young man who came to one of America’s finest universities in search of a degree that would grant him status and control over others, has come face to face with American Justice, with a capital J.
Dharun Ravi will get what’s coming to him, and because of the wise Judge Berman he still has a chance to become a good, decent human being. And while Tyler Clementi will never have that chance, we must remember that he took his own life, and was not murdered. He was driven to despair by the cruelty of a culture that said he wasn’t as good as his roommate, and he believed it. 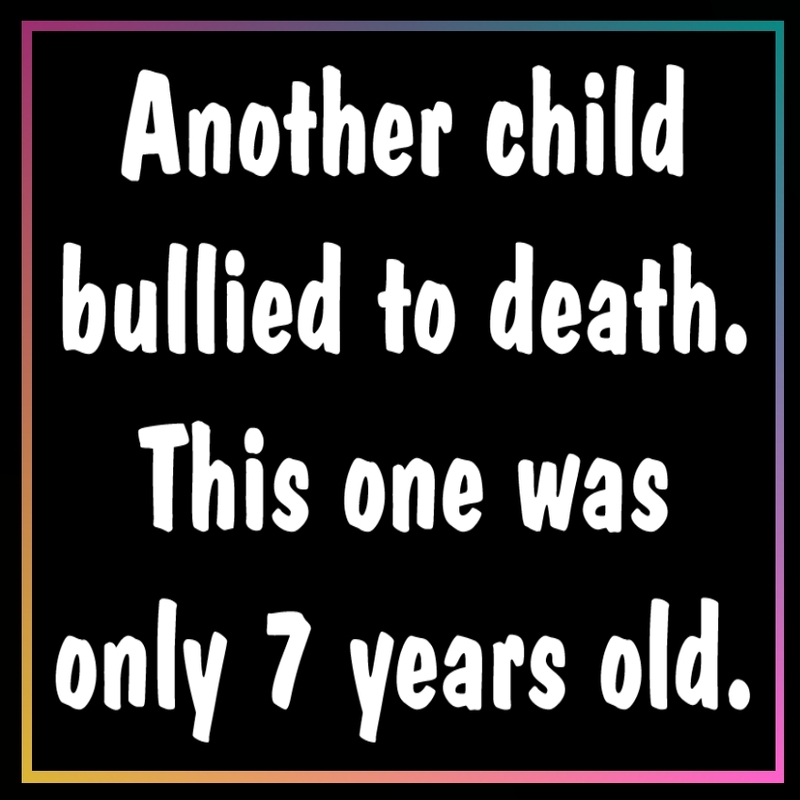 We have to change the system, and to do that we must start rounding up other bullies and making them pay now, not after another tragic suicide. The seven year old, who has not been named by the press, was bullied in school, an unsafe place that he most likely tried to avoid. When he couldn’t avoid it, he went knowing he would be humiliated, hurt, or furious by the time he got back. But even his neighborhood wasn’t safe for this first or second grader. After school and on weekends, he was bullied. Being the only boy in a houseful of eight women was most likely the fodder of many unkind comments at the boy’s expense. It was for my brother and he only had four sisters. His ‘safe’ world had shrunk from the big world of school, to the much smaller neighborhood where he lived. Now his world was reduced only to home, most likely the only place he’d been happy in a long time. We don’t know his family dynamics, or his relationships with his parents, but I’m going on the assumption that he was welcome and loved, given security and offered help. I don’t believe this child was ignored or unloved. His home was probably his only haven in a storm of abuse from the outside world. I’m not presuming to guess at the unthinkable reasons this youngster had for hanging himself, but it seems reasonable to me that his parents separating, thereby making his one last safe place no longer stable and secure, was the extra burden his small shoulders couldn’t carry. It’s a tragedy. In July, look for the release of my book for young readers about bullying in elementary school: Riding the Rainbow. Use that book to start conversations with your children about bullying, and offer it to your local school or public library. Until then, reach out to the children you know, no matter how young they are, and talk with them about bullies and bullying, and the need to tell someone so that they can get help. Together we will make bullying unacceptable, but until then we can provide support to the bullied. The more people address local schools about the issue, the better. The more libraries that have books like Riding the Rainbow to start dialogues, the more children we can reach, who will always start their own dialogues. My heart aches for the parents, family, and friends of this child. His death has forever altered the paths of their lives. Each will carry scars into their own futures, and make choices differently than ever before. As well as if a promontory was. Was Romney a typical school bully? Is he still one today? The Washington Post report on May 10th: Mitt Romney’s prep school classmates recall pranks, but also troubling incidents ignited a firestorm, especially coming, as it did, on the heels of President Obama’s May 9th personal endorsement of gay marriage. Kathleen Parker, opinion writer of the Washington Post, states that it’s all a great fuss over nothing important. She suggests that since the word gay had not yet been appropriated by the homosexual culture and the movement had not yet begun, then there could have been no gay bullying. Briefly, as told by a handful of boarding-school classmates, Romney led a group of boys who tackled and held down John Lauber and cut his longish, blond hair. Romney allegedly didn’t like Lauber’s look and decided to fix it. 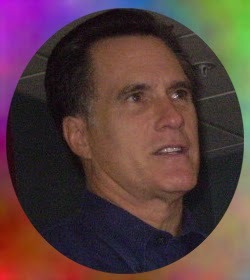 The subtext is that since Lauber later came out as gay, Romney is a not-so-closeted gay-hater. Tackled. Held down. Unless applied to sporting activity, those are bullying terms. Romney didn’t like Lauber’s look and forcefully changed that look, without asking or receiving permission from Lauber. That’s bullying. For those to the premises more recently arrived, a quick primer on 1965, when this occurred. Nobody knew who was or wasn’t “gay,” a word that wasn’t yet in popular circulation as a noun and generally meant “merry.” Homosexuality wasn’t on most high school kids’ radar, period. If anything, Romney may not have liked Lauber’s “hippie” locks, which is the more likely case given the era. 1965 was a time of repression and struggles for freedom. Civil rights for blacks dominated the liberal news, and the unpatriotic, war protesting hippies dominated conservative news. Gays were so repressed they didn’t even have an identity as a group yet, and that’s with anywhere from 2 to 10% of the population born LGBT. The lesbians and gay men of 1965 hid out in Mafia owned and controlled bars, subjected to police raids regularly. Many homosexual men were so ill informed about their natural sexual orientation that they bought into the societal references to them as Nancy boys, fairies, and poofs. Those terms were around, even if ‘gay’ wasn’t. And any school, and perhaps especially private schools, had plenty of awareness of homosexuals. That’s why the terms were considered so offensive, because they declared the receiver as less than, other, suspicious, and perverted. Whatever. Lauber obviously was a nonconformist in an environment that valued conformity, and Romney and his crew were indeed bullies. They shouldn’t have done it, but boarding schools until recently were not widely known as incubators of sensitivity. Today, of course, prep schools feature weekly diversity seminars and offer staff psychiatrists for the noncompliant. At least she admits Romney and crew were bullies, even if she then rushes in with the old tried and truthyisms: But everyone else was doing it too. and They’ve changed a lot since then. First of all, it takes a certain type of mentality to bully. Someone who’s mind jumps the fence and believes that one human being is inferior to another. Not everyone has that mentality. And second, if a school has made advancements in their social behavior and code of ethics, it certainly does not necessarily follow that any of the students taught in the offensive culture have done so. But five decades later, this is a campaign issue in a presidential election? Lauber’s family doesn’t think it should be — and they may be the only people who count in this particular debate. Um, no. I’m terribly sorry if they’re embarrassed by the story and the play it’s getting, but when Romney decided to run for president he opened up his entire history to public scrutiny. Now that we the public know that Lauber was bullied by a group led by ‘poor Mitt’ as Kathleen Parker calls him, every single one of us who has ever been bullied, or seen, or loved someone going through it, count in this particular debate. The real story, meanwhile, is the one that keeps getting pushed aside, which is that the country is going bankrupt and that 32 percent of young people (ages 18 to 29) are underemployed. Ms. Parker has a point about the urgency of the country’s growth and employment. But she shouldn’t worry – the 99% know how to keep the country from going bankrupt, and stimulate the economy – tax the 1% at a fair rate. When the economy starts receiving a steady infusion of income taxes from the ultra wealthy and large corporations, real small businesses (not the large corporations who find loopholes to claim they’re small businesses) will begin to thrive again. Solutions are all around us, and just an election away. But as long as we’re talking about things like gay marriage and contraception — all forced to the fore by Democrats, by the way — Americans can avert their gaze from the evolving economic collapse, which will be anything but gay. Forced to the fore by the Democrats? Is she flippin’ kidding? It has been Republicans uniformly who routinely put bills on state ballots to limit the civil rights of LGBT folks. Election after election gay folks have been brought front and center to bang the drum call for the ultra conservatives to show up at the polls. It has been a calculated ploy to bully us as a people, to garner and demand the loyalty of the people who have now become known as the Tea Party. And when the ground swell of support for gay marriage began to breach the 50% approval rating, suddenly the Republican lawmakers’ focus was back on contraception and women’s reproductive rights, presenting restrictive bills as fast as they can. Oh, and I see what she did there at the end, funny huh? The use of the word gay to mean merry, only it doesn’t, see, because the country is going to hell in a hand basket over a tempest in a TEApot. As a political leader, what are the ramifications of Mitt Romney being a bully? Hmm – a sense of justification for current bullies and those newly inspired to bully? A ‘sanctification’ of abuse? Might bullies find a sense of ‘entitlement’ to pursue their bullying, as after all, Mitt Romney does it? Will kids be telling each other the story of Romney and the queer, as boys of earlier eras told the tale of Washington and the cherry tree? I think it’s possible. And to keep that from happening I write books like The Boxer Rebellion.